My initial impression when this article popped up on email was that this is old news. We’ve been using 3% nebulised saline for Bronchiolitis in infants for many years (despite major concerns from paediatricians when we first started). A BET back in 2007 showed that there was a benefit in hospitalised children and it’s been standard practice for us since. So a new systematic review on the subject seemed a little late in the day! Maybe not? I vividly remember discussing the scope of the evidence back in 2007. The data at that time demonstrated a benefit for hospitalised kids, but what of admission avoidance? It’s probably safe to assume that hospitalised kids are the sicker end of the spectrum – no argument – the evidence then and now is pretty good for this group. If you are admitting the child – give them Saline nebs – it’s easy, as it often is for any patient at the more severe end of the disease spectrum – guidelines work well in those groups. However, as an emergency physician I often find the patients with moderate severity illness more challenging, and Bronchiolitis is a good example…. Now, you may work in a system where there are only HOME/ADMIT options and that’s fine, you will have to refer on, but here in Virchester the ED runs a Paeds obs unit where we monitor and review many patients in the ‘moderate’ category. Just a few hours you understand, less than 12 hours usually. So, the poorly, kid with Bronchiolitis ends up there in Virchester for observation, feeding, hydration assessments and……. ?Nebulised Saline?? Would you? Is there evidence to support it’s use for admission avoidance on the obs unit and in the ED? Back in 2007 we didn’t find any, but it’s a good question, and a new review on the topic goes some way to helping me answer that question. 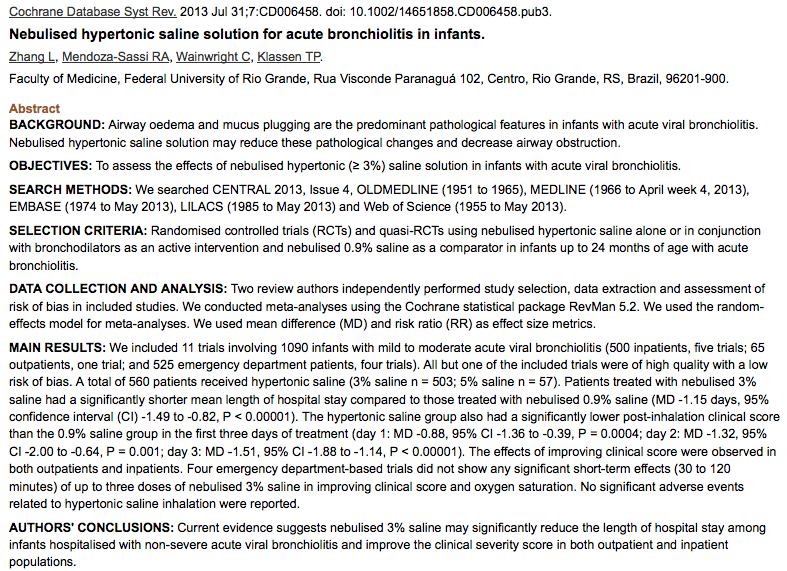 [learn_more caption=”What type of paper is this?”] This is a Cochrane review of the use of saline in Bronchiolitis. The authors have looked at all studies with a helpful differentiation between hospital and out patient (ED) studies. [/learn_more] [learn_more caption=”Is the quality good?”] The methodology seems sound and the authors have done a diligent search and appraisal of the literature. Trial quality is good. 11 trials are included comprising 1090 patients, and in all honestly they are all pretty small. 380 patients were included in trials based in out patients or the ED. 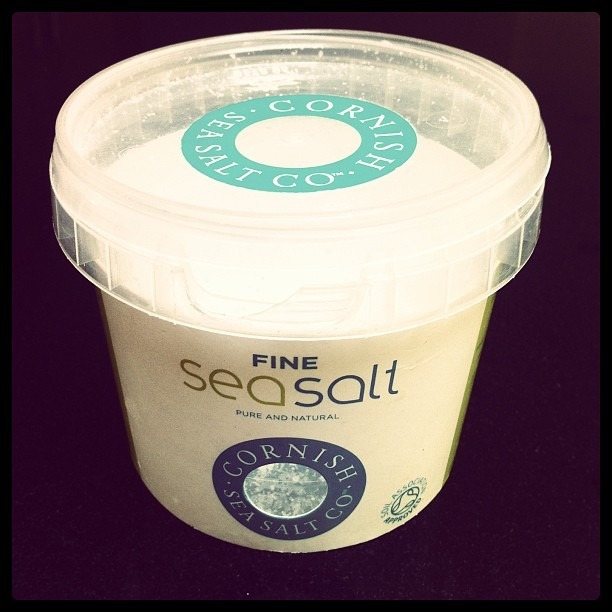 [/learn_more] [learn_more caption=”…and the main results are?”] Saline reduces in hospital stay… we kind of knew that! The average reduction in length of stay is 1.15 days which is great, and this is reflected in a reduction in clinical severity scores at day 1 and 2. What about the ED issues though? [/learn_more][learn_more caption=”So is my question answered?”] Yes and no. It’s great to see a trend towards admission avoidance but the numbers are tiny and the results are not statistically significant. [/learn_more] [learn_more caption=”So, a change in practice then?”] Well, I’ll admit that I’ve used saline nebs as an admission avoidance treatment for some bronchiolitics for many years. A saline neb, followed by observation on the paeds short stay ward often ‘seems’ to work, but without robust evidence I’m not sure anymore. There is nothing here that will make me change that practice, but I am really surprised that the management of this incredibly common disease and intervention is based on a small number of patients in rather disparate trials. It would be fantastic if we could get a decent powered RCT to answer this question and to clarify a treatment strategy for moderate patients. Simon. Glad to hear this is back on the menu. I tried in vain to get local Paeds to consider nebulised 3% a few years back. -Should we try neb of 3%? – ummm. Yes, the Cochrane…. – but, I think it was shown to help…. It’s cheap, easy and can decrease stays – perfect for a common disease this winter? Gosh. Certainly hope this persuades your local paeds. To be honest we just did it without asking. Whilst they are in the ed they are our patients after all. You would have thought that the mucolytic and osmotic effects of hypertonic saline would last a few hours, whereas the disease process lasts a few days. So can we really expect a single neb to modify disease course? I’d reckon not. It’s a bit like expecting a single adrenaline neb to modify the disease course of croup. Both of these treatments might make us feel better about sending the kid home, which isn’t necessarily a bad thing, and I’d reckon the kids feel better too. For a few hours. Yes, I think that’s a fair comment Jo, it’s that eternal question around a lot of the things we do in medicine…, are we just ‘doing something’ whilst nature carries on? It does make you wonder why they found hat they did. Confounders? Chance? Bias….or real? Perhaps a few hours of feeding catch up, sleep and calmness is enough? There’s a big retrospective study underway based in Toronto but involving lots of centres worldwide (virchester included! )looking at treatments, investigations, admission criteria etc in bronchiolitis. I’m certain one of the questions looks at nebulised treatments. So maybe something will resolved from that? I’ll keep you posted.